When Caravan Enforcer moves, he gains +1/+1. Caravan Enforcer is a common Agility creature card. It is part of the Heroes of Skyrim expansion. In addition to the card's availability in the Heroes of Skyrim expansion, three copies are included in the Brynjolf's Heist theme deck. "This one will protect us on the roads." "You shall not harm the caravan!" This card's ability applies the Mobile Enforcement card effect. 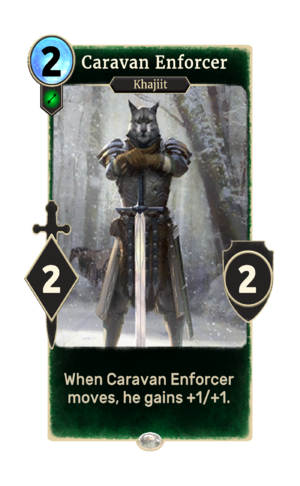 The card depicts Kharjo, a caravan guard who appeared in Skyrim. This page was last modified on 11 March 2019, at 21:30.